Currently dance lecturer at WSU Theatre & Dance department. Director of the African dance company “To Sangana”. 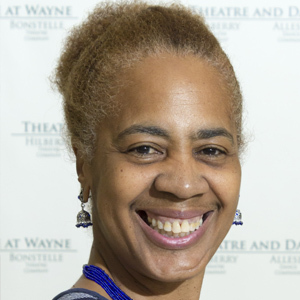 Karen Prall trained in Detroit (Dunham Technique & Horton) with Clifford Fears and Penny Godboldo, in New York (ballet, modern, jazz, African) studying at the Alvin Ailey Dance Center, working with Titos Sompa “Tanawa”(Congolese style). Prall has conducted extensive research on African culture, dance and music styles, in Congo, Brazzaville, Congo, Kinshasa, Accra, Ghana, Monrovia, Liberia, Senegal, Paris, and Hawai’i. Traveling to Suriname (South America), teaching and performing with W.S.U. Company One, traveling to Havana, and Santiago de Cuba 2012-2015, as well as working as an instructor.